Say this about the White Sox: They are doing their best to ward off the onslaught of football on the front pages of the sports section. 1. Ken Williams is separated from his wife, is dating, and enjoys Carlos Mencia. 2. Ozzie Guillen's son is a tweeting dolt. 3. The rift between Williams and Ozzie may lead to one or both of them walking away from their jobs after the season. 4. The bullpen is losing arms faster than Luke Wilson in Anchorman. 5. 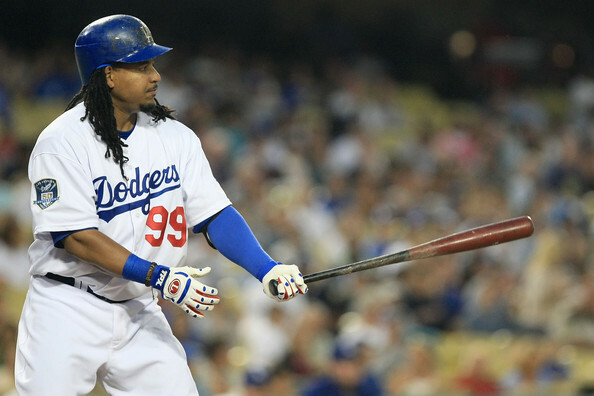 A trade for Manny Ramirez is in the works. I don't really care enough to write about numbers 1 and 2. Oney Guillen is irrelevant and Williams' divorce has zero effect on his dedication to or performance in his job. Number 3 will be important in two months if the team misses the playoffs, and Scot Gregor covers it thoroughly. With top two set up guys Matt Thornton and JJ Putz on the DL and no magic bullets left in the minor leagues, the bullpen problem is a big issue. Williams has hinted that he is looking into making a waiver deal to bolster his relief corps, but there's no indication of who he is looking at. The Brewers' Trevor Hoffman and the Angels' Brian Fuentes are names that have been mentioned in connection with the Sox; would they be good fits? There has been a lot of confusion over whether Hoffman, an all-time legend with 598 career saves, cleared waivers or was claimed by the Sox. In either case, he has a no-trade clause and is said to prefer staying in Milwaukee. He was cruising to one of the worst seasons ever for a relief pitcher into the All-Star break (8.33 ERA, 1.74 WHIP, .306 BAA, 5-for-10 in saves) which led to his loss of the closers role in Milwaukee. He has turned things around in the second half (2.57 ERA, 1.07 WHIP, .196 BAA in 14 innings since the break), but it would be shocking if he could come to the AL now and produce, even if he does have change of heart and accepts a trade. Fuentes has been an awkward but reliable closer for the Angels, and is no sure thing to clear waivers (though the Sox would probably have had the first crack at him among interested contenders). He is having a pretty good season in Anaheim, and, like Hoffman, has turned it on since the break (2.08 ERA, 1.15 WHIP, .163 BAA, 7-for-7 in saves in 13 innings). However, he is a flyball pitcher (22.2% GB rate this season, 33.7% career), and is allowing homeruns at the highest rate since his second season in the bigs (2002). That's not a good combination for the Cell. Maybe Trader Kenny has some other trick up his sleeve, but it's likely the Sox are just going to have to ride it out for the time being and hope that Chris Sale, Tony Pena, Sergio Santos and, sigh, Scott Linebrink can handle a little higher leverage work to get the ball to the suddenly-resurgent Bobby Jenks. So then there's this Manny thing. At best, I'm conflicted about it. On the one hand, the guy represents a lot of things I strongly dislike. He is just about the poster boy for bad intangibles: pouting, laziness, selfishness, money-loving, steroids, etc. He swindled his way out of Boston in 2008 and yet everybody gives him a free pass because he's Manny Being Manny. Basically, he is the exact type of player I hoped to never root for. Add to that he is 38 years old, off the juice, unable to capably play the field, has been on the DL three times this year and has less at bats than Mark Kotsay. Is that really worth $4+ million? On the other hand, we've seen what the guy can do when he's motivated, and he'll be playing for a contract next year. He was looking pretty broken down toward the end of his Red Sox tenure in 2008, and all he did to end that year was single-handedly propel the Dodgers into the playoffs by putting up a .396/.489/.743 line with 17 HRs and 53 RBIs in 53 games with his new team. He only plays when he's motivated, yes, but he will be motivated, if he wants to sign a new deal in 2011. His numbers this season in Los Angeles, while not quite up to his usual standard, are still impressive: in 61 games he's hitting .313/.407/.513. It's a good-looking line, though you wonder if he can shake off the injuries and stay productive down the stretch. ZiPS projects a nearly identical line the rest of the way, with a slight drop in batting average, if he stays in LA. Consider the Sox composite DH line for the season thus far: .243/.312/.409. Ramirez is so far and away an improvement over that line that you just cannot pass it up. Manny wants to use the Sox as a showcase to a big contract as an AL DH next year. The Sox want to use Manny's brief inspired production (before the newness wears off and he loses his motivation) to win the AL Central. The Sox would be using Manny. Manny would be using the Sox. The system works. I guess. We'll find out all the waiver details in a matter of hours this afternoon. Meanwhile, the Sox take on the Yankees tonight. According to multiple sources- Jon Heyman and Jayson Stark- the White Sox have won the claim on Manny Ramirez. The Sox now have until Tuesday afternoon to complete a trade.